There's never been a better time to get involved with Prometheus. As we speak, thousands of groups around the country are gathering resources and support to prepare for the largest single expansion of community radio in history. Here at Prometheus, we are working tirelessly to ensure that these communities have a voice, but we need your help. Whether you're in Philadelphia or Seattle, a radio expert or a beginner, everyone has the power to contribute to this movement. For people living near Philadelphia, there are a number of volunteer opportunities at the Prometheus office. Check out our volunteers page to look at our current needs, which could include anything from data entry to outreach. Those interested in a more sustained commitment can visit our Employment and Internships page. For those living outside of the Philadelphia area, there is still a great need for outreach. Many nonprofits, social justice groups, and activists across the nation have strong community support and worthy causes, but are unaware of community radio or still need help to get on the air. Look at the resources on our outreack page to learn how to connect with these groups and assist them in the process. As a nonprofit organization, Prometheus relies on the support of individual donors. Help us continue our efforts to free the airwaves from corporate control and bring the power of radio to your community by contributing a donation. Support our station building work with a gift to the Nan Rubin Community Impact Fund. For those interested in starting a community radio station or those who simply want to support them, check out Radio Spark. 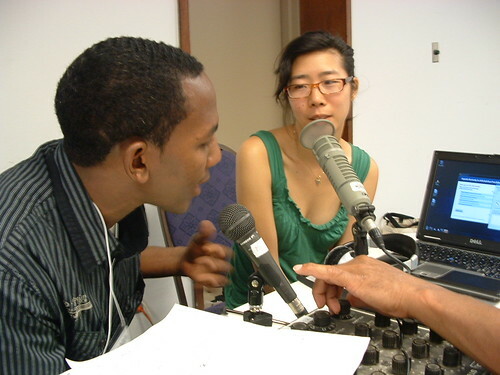 Created and run by Prometheus, the site offers an expansive forum for community radio novices and experts to ask questions, share resources, and connect with allies.